Left on the verge of starvation by her dissolute father’s gambling and drinking, the beautiful but resourceful young Syringa Melton is at her wits’ end. 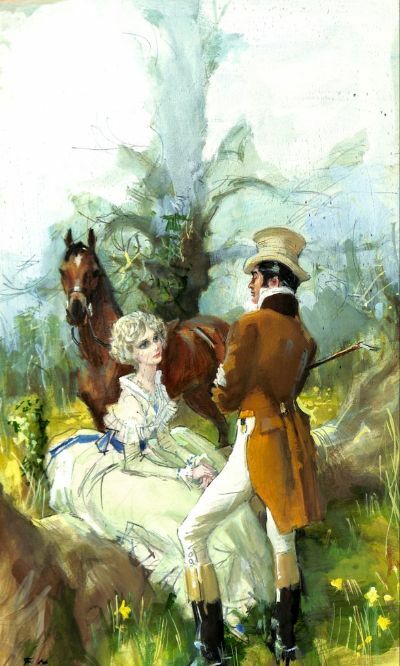 Not only has their delightful Manor House and all its contents been put up for sale at auction to pay off his huge debts, but also her beloved horse, Mercury. When the rakishly handsome Earl of Rothingham overhears her sobbing to Mercury in a last desperate farewell, his heart melts for her and without Syringa’s knowledge he not only buys the Manor House and Mercury but as well, through a strange misunderstanding , Syringa herself! A man determined to avoid marriage at all costs, the Earl finds himself reluctantly but irresistibly drawn to this innocent beauty who compares him to the Roman God, Jupiter, no less! But soon the conceited but enchanting Lady Elaine Wilmot, determined to snare the Earl for herself, entraps Syringa in a wicked plot that leaves the young beauty terrified and threatened in the filth of Newgate Prison, facing a flogging and the gallows. Unless, as she prays fervently over and over again, her Jupiter’ can come to her rescue.